I had to spend some big bucks at the store because I had to buy an expensive gadget for a Large Smelly Boy because our warped parenting thinking tells us it will help him be more successful at school. There’s some truth in there somewhere but I’m not wading in to find it. All I know is that I have a free turkey. And it’s big. I had absolutely no idea what that meant. This runner person came back minutes later breathing heavily and lugging this giant frozen carcass. I was thrilled. This is where another one of my dirty little secrets comes out. You see, along with being an advice column failure and picking up filthy rusty crud from sidewalks, I have yet another disability. Big numbers baffle me. Oh, I can do math up the wazoo. But things like population figures just don’t compute in my head. You mean China has how many bazillion people now? You see, that means absolutely nothing to me. I can’t even conceive of that. A bazillion? What’s a bazillion? You mean the U.S. debt is how many gatrillion? Again, that means nothing to me. So what’s 23 pounds of turkey when you’re feeding a family of four? Well, a quick check on the Google tells me that if a portion size is roughly 3/4 of a pound then a quick math up the wazoo means that I was expecting roughly 30.6666667 people for Thanksgiving dinner. Now a few days ago, knowing I had to go get this expensive gadget, Mr. Scatter and I had the same lightbulb at the same time. Get a free bird. I’m certain we had it in our heads after Mr. Scatter’s post about all the geezer mail he gets. In the comments, I reminded him about my favorite come-on that he received: If he agreed to test a hearing aid he could get a free turkey. No matter that no one in the Scatter Family eats turkey or that Mr. Scatter doesn’t need a hearing aid, except for when I ask him what’s for dinner. Ms. Reality commented that he should have gone for the turkey and donated it to the Oregon Food Bank. Again, the nonexistent nonhearing issue. What? Anyhoo, as I was plotting my recent trip to the store, I’m sure Mr. Scatter and I were both thinking, heck, we’re meat collectors now. We might as well get that free turkey. We can freeze it, we can donate it, we can certainly find someone who will appreciate it. Feeling just a little virtuous in my meat collecting/donating, and knowing I wasn’t going to have to cook it, I grabbed the biggest bird I could find. Yes, I’ve done the math up the wazoo. In fact, let’s do it together: That’s 21.12 pounds divided by .75 pound per portion computes to feeding 28.16 people. Feeling high on the dead turkey, I rolled that grocery cart through the store gloating at not spending $35.69 for meat that we won’t eat. And then I thought through the pile of groceries that I bought and the expensive gadget that made it possible to win my prize and as I wheeled that cart through the sliding glass doors on my way out the store I did a little math up the wazoo and it struck me. DAMN! I could have not bought TWO! 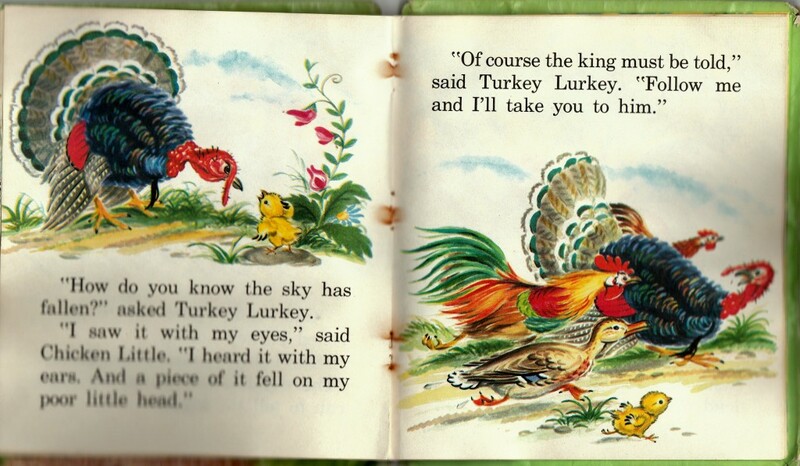 Turkey Lurkey is on the job in the “Chicken Little” book I had as a kid. It’s blurry because I once left it in the rain. Pictures by Marjorie Hartwell. Thank you Whitman Publishing Company for some good times growing up. 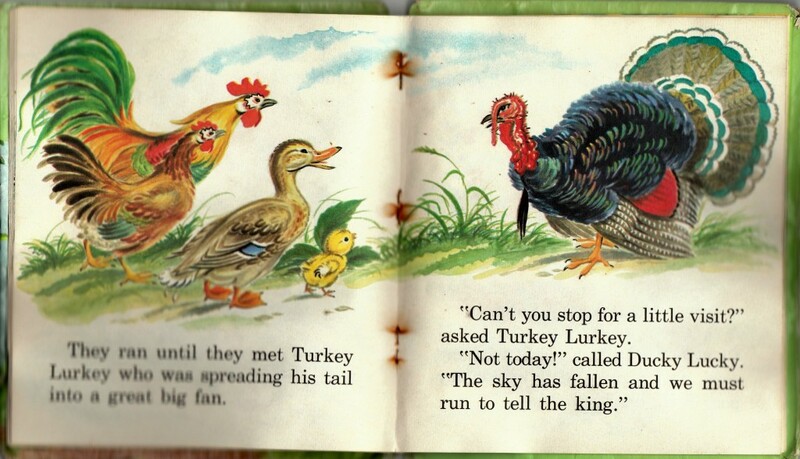 Turkey Lurkey, tell the king, tell the king! Just don’t tell him you’re in my freezer. The rest of the info, ditto above.